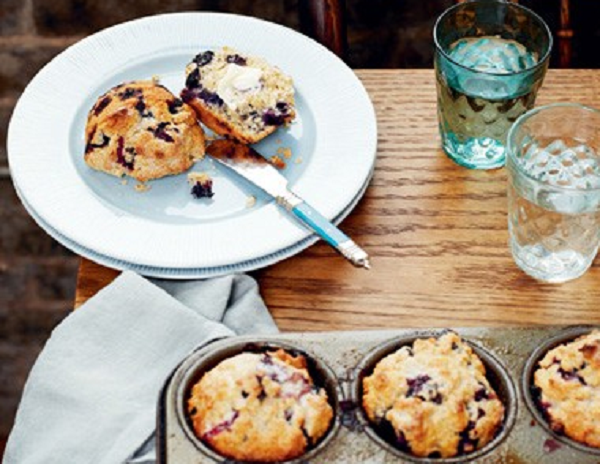 These large, fat muffins are filled with blueberries. The secret to all muffins and other quick breads is to mix just until moistened and no more. This recipe makes eleven instead of a dozen so that each muffin cup is filled right to the top. 2. Generously butter 11 cups of a medium-size muffin pan (or pans). Make sure also to butter the top surface of the pan because the muffins will spill over during cooking. 3. Combine the flour, sugar, baking powder, and salt in a large bowl and mix well. Add the berries and gently toss to coat them. 4. Beat the eggs, milk, and vanilla together, and carefully mix the liquid into the blueberry mixture just until moistened. 5. Add the melted butter and mix just until blended. Spoon some batter into each muffin cup so that they are filled to the top. Sprinkle some sugar onto the top of each muffin. 6. Bake for 15 minutes, or until a knife inserted in the center of a muffin comes out dry. Let sit on a wire rack for 10 minutes before removing them from the pan. (If you want an extra sparkle, then sprinkle a little sugar on top of your muffins again as soon as they come out of the oven.) Serve hot. NOTE: These Blueberry Muffins do freeze and reheat well, so if you are going to be pressed for time, or if you have any leftovers, wrap them in foil or plastic once they are thoroughly cooled, then freeze them in a plastic bag. Reheat them un-thawed in a 350°F oven for 15 minutes, or until hot throughout.